If you’re a big fan of golf, then the chances are that at some point during your life, you will have dreamed of owning your own golf course. Sadly, for many of us, this dream never quite manages to come to fruition. However, with artificial putting greens, there is another, more attainable, option – creating a miniature golf course in your own back garden! If you have a large garden, it is easy to put aside a section of your garden to turn into your brand new miniature golf course. For those with smaller gardens, instead of creating a permanent feature in your garden, it could be a better idea to create a course that can be used in the summer months then packed away during winter. With minimal time and effort put in, the results can be enjoyed for years! In fact, the use of artificial putting greens makes the whole process much simpler than you might think. Plus, just think of all the fun you can have playing a round of miniature golf with your family and friends once the course is complete! Before you start work on your miniature golf course, there are a few things that you will need to take into consideration. Firstly, you need to consider how big your course is going to be. How big is your garden? How much use are you planning to get out of your miniature golf course? These should all be factors that influence your decision. Planning is essential. Make sure that you plan out the course before starting any work, as it is much easier to alter a design than to adjust half a golf course if something isn’t quite right! For your miniature golf course, you need to ensure that you have a durable surface which can easily endure everyday wear and tear – artificial putting greens are the ideal solution. 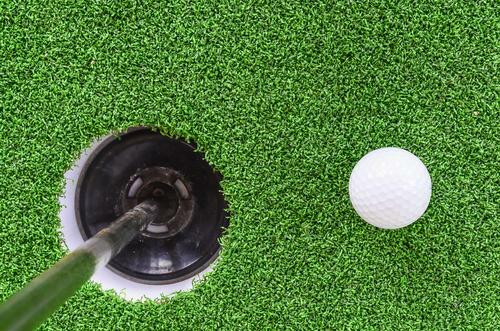 Kit out your miniature golf course with fake grass to guarantee it looks great all year round. Synthetic grass is the perfect low-maintenance, cost-effective answer to your requirements. Of course, it goes without saying that miniature golf courses need decorations! This is the perfect opportunity to get creative and use your imagination to come up with unique and wacky ways of decorating your course. From the usual crazy golf décor to a classier theme with plants and fairy lights, the sky is the limit when it comes to decoration. For more information about our synthetic grass installation and artificial putting green services, please give us a call today on 01474 364320.